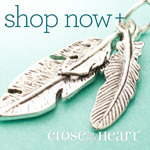 Did you know that Close to My Heart donates $7 from the sale of each Punny Pals stamp set to Operation Smile? And did you know that during the month of October you can get an adorable Card Kit with matching thin cuts for just $39.95? Yep, all those things are true. I stopped by the Atlantic Hearts Sketch Challenge Blog this afternoon looking for something fun to do with the Punny Pals stamp set and lucky me I loved the sketch – what’s even better it allowed me to try a new technique that I recently saw on Jennifer McQuire Ink using a stitched rectangle die to make a unique card base. Close to My Heart’s Two-Toned card stock works perfectly for this technique…you can see just a peek of the lighter shade on the edges. Flowers just wasn’t the look I was going for so I added a couple of banners and a heart cut from the Blossom Fundamentals and then popped up my frog. The sentiment You’re toad-ally awesome was highlighted by a black dot. 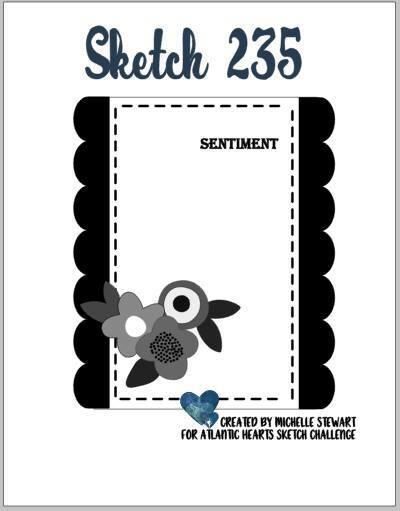 Make sure you take a minute to stop by the Atlantic Heart Sketch Challenge Blog this weeks sketch is so fun and would be a great combination with the new Color My Heart Color Dare challenge that will be posted tomorrow. I appreciate you stopping by…hope you have a toad-ally awesome day. I love to read your comments so if you have a minute please share your thoughts with me. 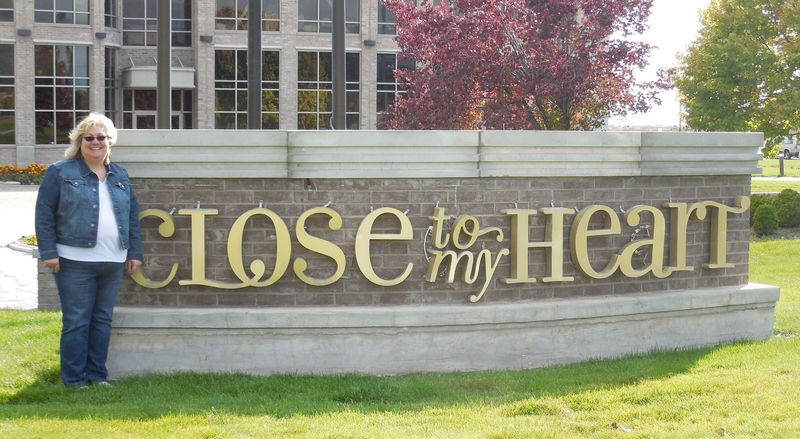 Happy Friday and welcome to another week of the Color My Heart Color Dare. This week we are featuring the colors: Peacock, Willow and White Daisy. As you might have imagined the first thing I thought of when I saw this combination was football…not just any football, but Seahawks football. It would really have been better if the Peacock was Pacifica, but I’ll compromise. I had a lot of fun with this card. It’s a 5X7 football invitation. The time to party sentiment is taken from the Cricut Flower Market collection. Close to My Heart’s clear stamps make it so easy to divide your images into different colors – here the Time To was inked in Willow and then Party was inked in Peacock – a little huff on the stamp and it was ready to go. The cute invitation set was sitting on my desk – it’s an exclusive consultant stamp, but was too perfect not to use. Leave me a comment and let me know what your favorite sports team is and you could win a 4 pack invitation set from me. 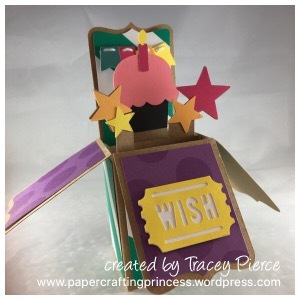 One of my favorite things to do is surprise someone with a homemade birthday card, what’s even more fun is when you send them an entire party in a box! I made this cute box card using cuts from the Cricut so although it’s full of details it didn’t take much time. In my humble opinion there are no better colors for a birthday than the Adventure color family. 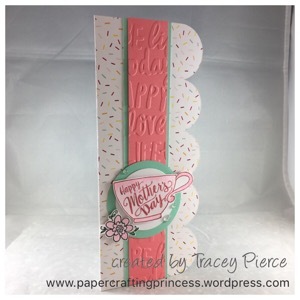 I reached for solid cardstock and fun patterns from the Fundamentals Paper Collection to complete my card. With 24 12X12 sheets (2 each of 12 designs) you have plenty to choose from to make completing cohesive projects easier than ever before. Priced at just $19.95 they are a terrific basic for your scrapbooking or card-making needs. They also have matching complements and ribbon – woohoo! If you’d like to learn more about the fundamental line please let me know the patterns are so much fun to play with. Thanks for stopping by…I look forward to hearing your comments on this card.